A 67-year-old woman has been rushed to hospital with life-threatening injuries after being struck by a vehicle in Scarborough’s Oakridge neighbourhood. It happened at Danforth Road and Patterson Avenue shortly before 7 p.m.
Toronto police said the woman was walking along Danforth Road on the sidewalk and was crossing at Patterson Ave. when she was struck. The woman was found unconscious at the scene and was rushed to a trauma centre in critical condition. Zambri said the SUV was last seen driving off in a northeast direction on Danforth Road. Police are canvassing the area for witnesses and are appealing to the driver of the vehicle to come forward. “It would be in their best interest to turn themselves in as soon as possible,” Zambri said. Area roads have been closed down as police investigate the incident. 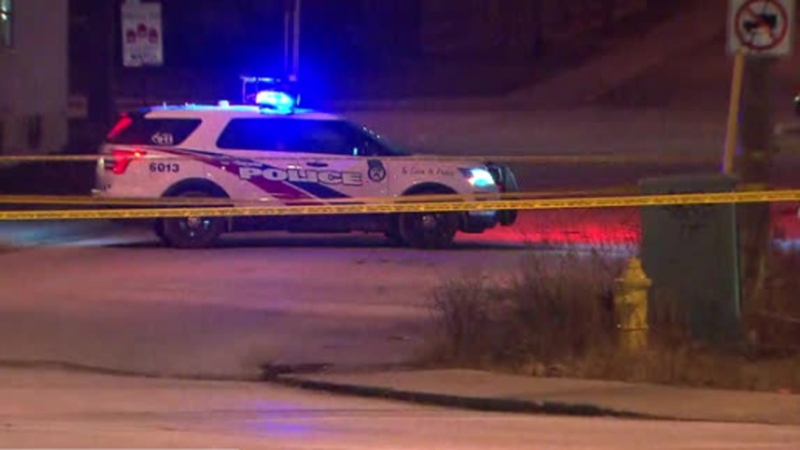 Police investigate after a woman was struck by a vehicle in a hit-and-run near Danforth Road and Patterson Avenue Thursday January 17, 2019.